Girl Weed & I braved the ice to see the Shakespeare Theater's production of Two Gents last night. It's good -- solidly acted-- but odd. By his own testimony director P. J. Paparelli wanted to leave the periodicity (if that's a word) of Shakespeare intact, but somehow capture the energy of teenagers. I'd say he manages that effectively. 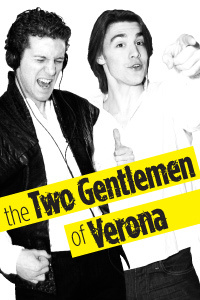 Two Gents is a difficult play to stage thanks to frequent scene changes that cut up the action. Not only do the changes take time that can make things drag, but then over and over you, the audience, have the burden of figuring out where you are now. It can make a light play feel long. Paparelli solves this problem in two ways: one basic set serves as backdrop for every location; only a few simple set pieces change. He also uses opera-style captioning to tell us where everyone is and in what condition. Ingeniously, these comments are milked for comedy -- as if they were texted quips coming from the clown Launce. It really keeps things humming. The best-paced Two Gents I've ever seen. However, Paparelli chooses to place us in a hybrid time period and style. The men wear Elizabethan doublets over jeans (sometimes in plush fabrics, but still jeans) and sneakers. The women wear full Elizabethan costume, but everyone hangs out at the Ale House, which is like a hip club of today, and contemporary pop tunes (All The Single Ladies, anyone?) pepper the action. The teen music and clothing and era-bending did give an impulsive-young-love energy to the action, but I never got to the point where I simply "accepted" the hybrid time periods. I found it distracting. Also odd was all the product placement on the set. The opening scene takes place in a parking lot outside of a McDonald's, one quarter of the "M" of the golden arches making a significant part of the set, and ads for other products are everywhere, as if we were in an arena. An ersatz Apple logo on one wall, a Barilla pasta logo hanging in mid-air in the Duke of Milan's home in lieu of art. At first I thought maybe this was heading towards some sort of critique of consumerism discovered in the text, but no....the ads are just there. As part of teen culture, I suppose, but they didn't add anything for me. Again: distracting, as was the idea that so much should rely on old-fashioned love notes requiring servants to deliver them when the characters could just text each other. In the end I think it didn't quite work as not every conceit does. Enjoyable nonetheless. And the dog who plays Crab is darling!